If you are looking for information on the IN2IT Nutrition & Fitness franchise business opportunity, IN2IT Nutrition & Fitness franchises or IN2IT Nutrition & Fitness franchising, then you have come to the right place. Are you ready to start your own business that allows for unlimited income potential while helping your community reach their health and fitness goals? Are you ready to fulfill your business ownership dreams in one of the fastest growing markets in the fitness industry? IN2IT Nutrition & Fitness™ is one of the first nationwide franchise opportunities that features nutrition products and a personal training studio-all under one roof! Our founders had a vision to improve the sports nutrition and fitness industry by providing clients with a one-stop experience. Their vision resulted in a business model that creates a more personalized and consistent approach to nutrition, which is very important for achieving fitness goals. Clients can exercise with a personal trainer, get personalized nutrition advice for their dietary needs and have access to the top brands of nutritional supplements allowing IN2IT™ to provide a comprehensive fitness program. Now we are sharing our knowledge and proven business model with YOU! Being a part of a growing industry: Health & fitness is one of the fastest-growing industries with consumers spending over $25 billion dollars in each sector according to Nutrition Business Journal. 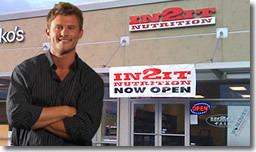 A convenient and unique business model: IN2IT Nutrition & Fitness™ is one of the first nationwide franchise opportunities that offers clients a hybrid of nutrition products and fitness training in one location. Low staffing requirements: Depending on the IN2IT™ model (Express or Standard) you choose, you can operate your business with as little as two people including yourself. 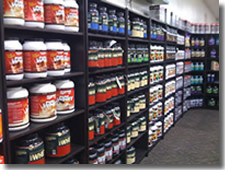 Multiple potential revenue streams: Your business will offer clients personal training services; full line of nutritional products and supplements. Plus, you can expand your business by offering juice bars, sports performance coaching, rehabilitation, physical therapy, massage, aerobics, or exercise apparel. Flexibility and support: As an IN2IT Nutrition & Fitness™ franchise owner, you will have the freedom of being your own boss with the support of an experienced team behind you. The IN2IT™ staff has years of industry experience that will guide you through every step of opening your business and will support you once your franchise is operational.